Summary Versatile hardtail bike. Great choice for any mountain biker. 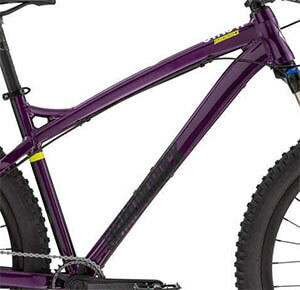 Do you need a unisex mountain bike that’s versatile, durable, and incredibly fun to ride? If any of that sounds appealing, then you need to learn more about Diamondback’s Sync’r mountain bike. We reviewed this bike in-depth to provide you with all the information in one place. By the end, you’ll have a better understanding of what this bike has to offer, and whether it’s the right choice for you. 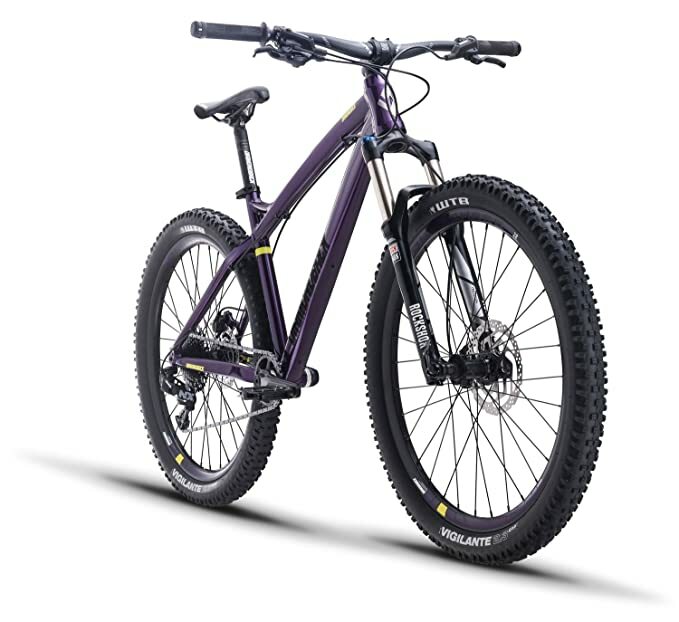 The DB Sync’r is a fantastic choice for women looking to experience mountain biking. We liked how this bike allows you to ride up/down hills, as well as through challenging trails. People who are look after a bike with a lightweight and extremely durable frame will be impressed by what the Sync’r has to offer. When it comes to riding a hardtail bike, you want to be open to as many gear options as possible. This enhances the riding experience drastically. Having many gears to select from gives you the chance to choose the correct ones according to your specific riding conditions. As a result, you can be sure to ride in the best gear that improves the riding experience, regardless of the kind of terrain that you’re riding on. This Sync’r bike comes with a total of 11 gears. This is plenty and helps you to tackle tricky terrain with ease. No matter whether you’re trying to climb a steep hill, or ride down one, you will always be able to select the most appropriate gear. Moreover, we were impressed by the shifter that they’ve attached to the bike. It’s an X-actuation trigger shifter. It provides you with the ability to quickly and smoothly shift gears, with minimal effort. The fork and frame of a bike are vital parts that can either add to the experience or take away from it. So, do they frame and fork of the Sync’r enhance your riding experience? We were glad to find that they do – tremendously. They’ve chosen aluminum materials to construct the frame of this bike. As a result, you are left with a bike that is both incredibly durable and lightweight. We liked how the geometry of this bike has a progressive design. This makes it exceptionally comfortable for women too. Therefore, women can enjoy longer rides on tricky terrain while being more comfortable. The way the frame has been designed also means that you’re in a position that prevents fatigue from setting in too quickly. Since this is a hardtail mountain bike, most people will be expecting the suspension mechanism to be effective. When it comes to the DB Sync’r, this is the case. A Rockshox Recon RL Solo Air fork has been fitted to this bike. It has an impressive 130mm travel suspension fork. Therefore, it works incredibly well to provide you with remarkable amounts of stability. While riding across rough terrain, it’s common to become easily fatigued. However, because the suspension system on this bike absorbs the shocks from the surface, you don’t have to deal with them. So, you don’t need to grip the handlebar as tightly to keep yourself on the bike. The suspension does the hard work for you. 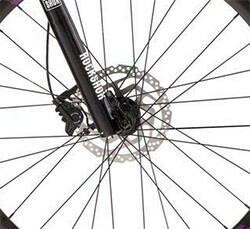 While cycling on off-road conditions, the braking system of a bike needs to be top notch. If not, you’ll be leaving yourself more prone to potential accidents. 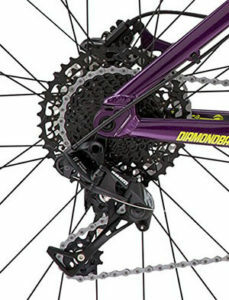 Having said that, this is not something that you need to be concerned with when it comes to riding Diamondback’s Sync’r. Diamondback decided to use hydraulic disc brakes by Tektro with this model, and we found them to be astoundingly effective and reliable. One of the features surrounding the disc brakes that stood out to us is the fact that there’s a common problem with them overheating. However, the ones on this bike are exposed to air; therefore, any build-up of heat is minimized. We also liked how these brakes work to bring you to an immediate stop, regardless of the conditions that you’re riding in. Moreover, using the brake levers proves to be responsive and very easy to get the hang of. The chain is a crucial aspect to all bikes that are involved with the amount of power that can be transferred from your pedaling to the wheels. So, how does the chain on the Sync’r hold up? After extensively researching this bike, we were impressed by the chain that has been fitted to it. 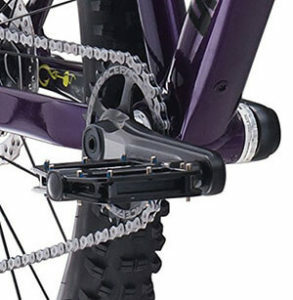 It uses an SRAM PC1130 Powerlink chain. This provides you with an incredible amount of power output. This means that with each pedal that you take, you’re able to get the most out of this bike. Provided that you’ve selected the best gear for your situation, you will be able to experience a lot of power with every single pedal that you take. As a result, you can reach high speeds while riding this bike, which adds to the enjoyment factor greatly. The saddle plays an enormous role in determining how comfortable you feel while riding a bike. Does the seat on the Sync’r feel comfortable? Fortunately, the saddle equipped on this bike is both comfortable and very supportive. It’s a little narrower in shape and has a downward slope design, along with some great padding. The design of the saddle works alongside the frame geometry to ensure that you’re able to sit and ride in the most comfortable position possible. With the padding on the inside, you can also feel confident in knowing that this bike will feel fantastic to ride for longer journeys too. 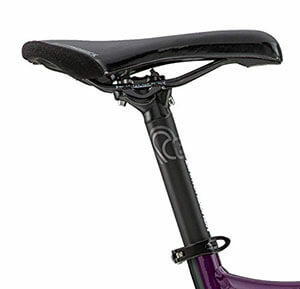 Furthermore, we liked how you can easily adjust the seat post to make sure the seat is at the perfect height for you. Question: Are there any grips with this bike? Question: Does the Sync’r use an air or coil system? Question: Does this bike fit for short rider? When it comes to purchasing mountain bikes online, some people are concerned about the assembly part. Like other beginner-level mountain bike the Diamondback Syncr is delivered to you in a nearly fully assembled state. It’s around 95% assembled. There are only a few easy parts that you would need to put together for yourself. They make sure to include an instructions guide, as well as all the tools that you need to complete the job. For those with experiencing building bikes, assembling this one will be a breeze. On the other hand, if you don’t quite feel confident enough to put it together yourself, you can simply take it down to your local bike shop. For an added cost, they can assemble the various parts and tune the bike to ensure you can ride it to its full potential. 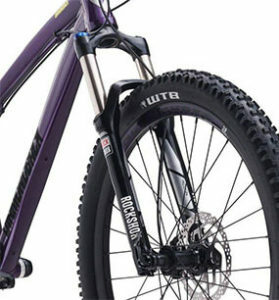 So now, you know more about what the Diamondback Sync’r has to offer. It’s a remarkably versatile bike that has an excellent geometry for women. All the riding features work astoundingly well together to provide you with a mountain bike that allows you to explore different trails and off-road riding conditions. Use our review to consider all the features, pros, and cons to help you decide if this is the best bike for your needs.